The faculty was kind enough to schedule Monday classes at 10 am rather than 9. Perhaps they felt it would make up for our early Wednesdays at the hospital. I was thankful for the extra hour of sleep. Although... I'd almost rather go ahead and get up at 9 for the extra hour of lecture. Health Assessment has been crammed into a two hour block once a week... and we might just need that extra time. Nursing school is infamous for test questions asking "Which of the following would you do FIRST?" Vocabulary, structure, and function are taken for granted; you will not be tested on the normal lab values or definitions of diseases. You are given scenarios. Hypothetical cases. You're asked to assess the person completely, and relate a nursing diagnosis and nursing care plan. My Monday Health Assessment class focuses on the many, many variables a nurse should consider in patient care. Practicum exams involve going into a room and noticing every detail of that long list for the patient, then returning to an empty room to document each finding from memory. In essence, the purpose of nursing school is to make you obscenely observant. My first Health Assessment exam is in two weeks, and will cover 270 pages of material. 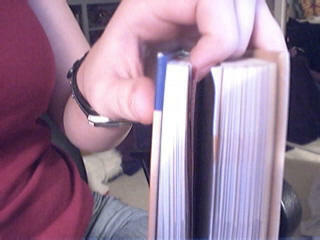 That's about a third of the textbook. Thankfully I've kept up with the weekly assignments, and have read all 12 of those chapters. But I'm still a little anxious about the upcoming test. The grade scale is such that you must make at least an 80% to pass. I've already taken an exam in two other subjects thusfar (and scored 96 and 90, an A and B). But this class is supposed to be "the hard one". I've already started reviewing the material. I joined the Student Nurses Association, and was glad to attend their first meeting of the year this afternoon. It was during lunch break, so they thankfully fed us free sandwiches. A better meal than I would have time to acquire myself. So far this whole pre-professional organization thing looks promising. SNA apparently sends students nursing journals as part of their membership: reason enough to join. But they also focus on several community service projects throughout the year. They talked about making shoebox care packages to Katrina victims today, which is a nice idea. I am apparently designing the T-shirt for this year, so hopefully I'll be able to come up with something interesting in the next few days. I'm looking forward to becoming more actively involved at school this year. I've been a pretty lazy college student up until now; even though I am completely capable of leading, I often don't volunteer for projects. Since I've been spending such a ridiculous amount of time up at the school lately, I've started to feel pride in my alma mater and degree. I want to be in SNA... maybe even in SGA too. I want to be involved in campus policy and in helping the community under NSU's name. How did ur assessment exam go?